For commercial businesses seeking a stylish wireless access control device that can be easily retrofitted to interior doors, the Aperio® H100 is available from ASSA ABLOY Access Control, a UK division of ASSA ABLOY, the global leader in door opening solutions. The newest product in the Aperio® technology range, the Aperio® H100 combines the power and flexibility of wireless access control into a slim, cleverly designed door handle. 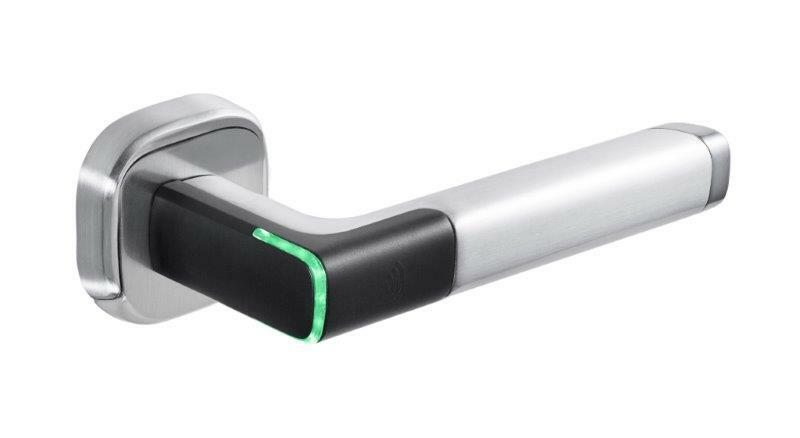 Compatible with most new and existing access control systems, the Aperio® H100 is very easy to specify with only two parts to choose from - a left and right handle. It’s also easy to fit, with no drilling or wiring required, and can be retro-fitted to almost any interior door. Furthermore, any existing mechanical cylinder can still be used too. Battery-operated, the Aperio® H100 is ideally suited for business environments that experience high levels of traffic, and integrates with an extensive range of third-party systems. This includes iCLASS®/ ISO14443B, iCLASS® SE, Seos®, MIFARE® Classic, Plus and EV1, and DESFire® SE. The Aperio® H100 can operate as part of an online access control system or offline as a standalone device, and is available in either a left or right-hand models for a door between 35mm and 80mm thickness. The device is also available with the option of a U-handle and USB adaptor. “The Aperio® H100 is a fantastic addition to the Aperio range and enables access control capabilities to be added to almost any interior door. It’s an affordable and stylish solution that’s been designed to perfectly complement the modern office environment, or any premises that requires access control. Aperio® is a smart access control technology that enables mechanical locks to be wirelessly linked to an existing access control system in a convenient and cost-effective way. The H100 is the latest addition to the Aperio® portfolio, which includes online and offline cylinders (C100/C900) and escutcheons (E100/E900), locks (L100/L900), and a wireless lock (KS100) for bringing server racks and cabinets into the same access control system as doors. For further information on the Aperio® H100, please visit assaabloy.co.uk or contact Aperio® specialist David Smyth via email at david.smyth@assaabloy.com, or via LinkedIn.